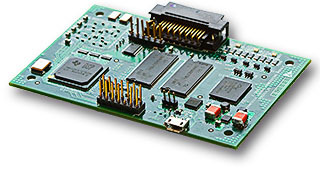 The Biomedical Signal Processing Module is a high performance floating point digital processing platform optimized for precision waveform capture and processing. The platform is specifically designed for biomedical applications that require substantial embedded computing resources for advanced diagnostics and real-time control. This module introduces the next generation E-trolZ signal acquisition engine which builds on the precision acquisition core by adding data validation. As signal data is communicated multiple times by different hosts, data tagging as indexed by the source provides the mechanism to ensure validation. The Biomedical Signal Processing Module is used in medical devices as an embedded controller or as a dedicated, protected domain algorithm processor streaming diagnostic results to an embedded host. It is also used as a MatLab USB client delivering full bandwidth waveforms over USB for real-time processing or analysis in MatLab. Lastly it is used as a MatLab development module for direct deployment of MatLab code into a medical device. This module is available off-the-shelf. However, as is the case for all E-trolZ’s platforms, customization to meet your specific needs is always available. The basic development kit includes a module and the software development kit, while the full development kit adds Code Composer Studio and a USB JTAG emulator.